To maintain a clear message and hold your audience’s attention, keep the number of slides in your presentation to a minimum. That goes for the content on each slide, too. Avoid clutter by limiting each slide to a headline, a few bullet points and maybe an image. Plan your presentation so that just one new point is displayed at any given moment, and use note cards, a separate Word document, or the notes panel in PowerPoint to record your detailed talking points. 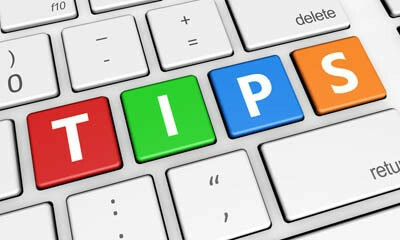 Your slides are an outline for your presentation, not the presentation itself, so avoid displaying large blocks of text. Allow your audience to focus on what you are saying instead of reading the screen. Use bullet points and short sentences, and try to keep each thought to one line, without wrapping the text. To further reduce word count, consider eliminating “a” and “the” when possible. Using a “font pair” – one for your headers and the other for the body copy of your slide – will give your presentation a polished, professional look. To ensure your PowerPoint presentation is easy to read, stay away from narrow styles and script, such as Arial Narrow and Calligraphy. Instead, use sans serif fonts, such as Arial, Helvetica or Calibri, for your body copy, and reserve classic serif fonts, such as Georgia or Baskerville, for large headlines. Basically, web friendly fonts for your virtual audience. If you are presenting to a room, instead of a virtual meeting, the size of your font matters, as well. For every 10 feet, you should increase your font size by an inch, or 72 pts. For example, a 72pt font is readable from 10 feet, while 114pts is readable from 20 feet away. Images can help tell your story and add visual interest, but they can also hijack your presentation and detract from your message, so balance is key. Use images only when they add important information or help illustrate a more abstract point. Avoid PowerPoint’s built-in clipart at all costs – your audience has likely seen those graphics a hundred times – and stay away from animations: fades, swipes and flashing text, as well. Using different layouts and designs for each slide can distract the audience and make it hard to follow, so consider using a PowerPoint theme or the same slide template throughout. Likewise, if you decide to unveil bullet points one at a time at the beginning of the presentation, and then switch to showing all the bullets at once, it can be disorienting for the audience, so try to format the content on each slide in a similar way. Another good rule of thumb? Align all text either left or right and stick with it. A deep contrast between the font and the background color will make your presentations much easier to read. While dark backgrounds with light text are tolerable, dark text on a light background is preferred. This is also a good time to mention that red text is rarely a good idea, not only because it signals “stop” or “danger”, but because it tends to washout when projected on a screen. Red/blue and green/red text and background combinations can cause eye strain, fatigue and discomfort. In fact, color bind individuals may not even be able to read green text on a red background. This goes without saying, but to earn and maintain the respect of your audience, you should always proof your presentation for spelling and grammar mistakes. If you’ve been staring at your slides for weeks, enlisting the help of a second set of eyes to scan for errors can be incredibly useful. It just might save you from the embarrassment of seeing your minor slip up in 72 pt. font. Concerned about video lag, audio issues or other technical glitches during your webcast? Consider a professional webcasting service, like Worktank. Our webcasting services ensure that all aspects of your webcast are properly configured and risks are properly mitigated prior to participants joining. Worktank also offers presenter coaching and can help with the messaging in your PowerPoint presentations. To learn more about how we can create a custom webcast service plan to meet your company’s needs, call (877) WRKTANK or contact us.